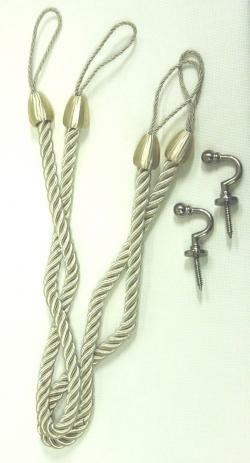 Curtain tiebacks are the perfect finishing touch to your brand new curtains. They keep your curtains tied back to each side when your are not using them allowing the natural light to flow into the room without the curtain creeping closed. In a great neutral colour, they are designed to suit every colour curtain. They will suit eyelet curtains as well as Pinch pleat curtains and Pencil Pleat curtains. Each tieback is about 50cm total length.